South West BirthWorkers is a collaboration between Emily Fuller and Fiona Willis, two birth workers living in Somerset. We offer Continuing Professional Development for midwives, doulas and other birth professionals in the form of workshops, study days and retreats here in the South West of England. An Introduction to Breech Birth with Mary Cronk, MBE RM RGN ADM NCDN, and and Joy Horner RM RGN Dip H.Ed. Creating Menstrual Health with Alexandra Pope, author of The Wild Genie: the Healing Power of Menstruation (Sally Milner Publishing, 2001), The Woman's Quest - a 13 session self guiding course (self published, 2006) and co-author of The Pill; are you sure it's for you? (Allen and Unwin, 2008). 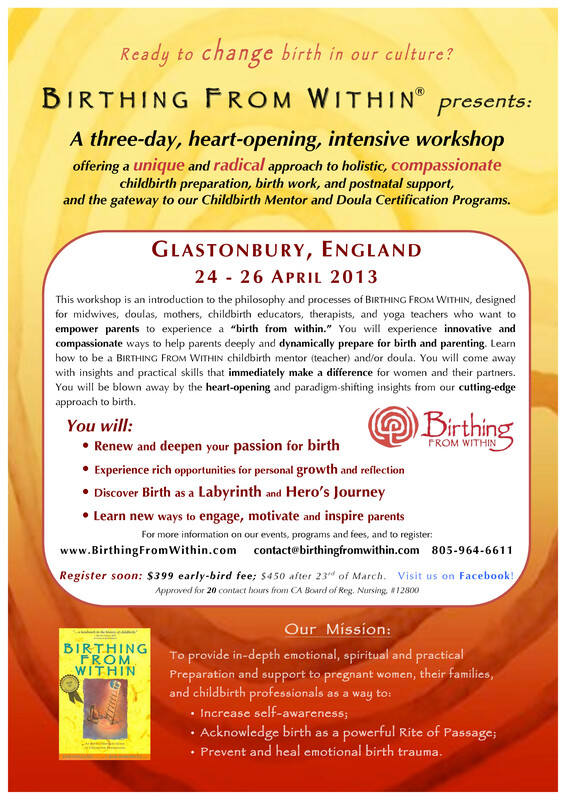 Birthing From Within - Introductory Mentor & Doula workshop: The Art of Childbirth Mentoring with Virginia Bobro, Senior Workshop Facilitator and Managing Director of Birthing From Within®. Healing Birth & Awakening the Divine Feminine with Benig Mauger - residential workshop and retreat with Jungian psychotherapist and author Benig Mauger. Moonsong and Connecting with the Shamanic Dimensions of Pregnancy - one day workshops with Jane Hardwicke Collings from the School of Shamanic Midwifery. Supporting Every Birth - a workshop with Michelle Every for birthworkers on supporting families with stillbirth and infant loss. Emily is a mother, midwife and Interfaith Minister. She has worked independently as well as in hospitals, birthing centres and the community for 15 years supporting women in their choices during pregnancy, birth and beyond as she is passionate about supporting women and families through this transformational time. Emily has experience of teaching a variety of classes, including aquanatal classes, infant massage and yoga in pregnancy, and she is also trained in using shiatsu and aromatherapy within midwifery. Emily is an Interfaith Minister offering support for people of all spiritual and faith backgrounds. One of the services that she offers is Blessingway / Mother Blessing ceremonies for women to celebrate their upcoming transition into motherhood and to support a deeper level of preparation for this transformation and have run birth preparation retreats for women and their partners. Emily has also recently trained as a Soul Midwife with the School of Soul Midwifery which for me completes my circle of care, offering emotional and soul centred support for those who are finishing their journey on this earth as well as supporting their friends and family. Being the mother of two awesome young boys is Emily's greatest pleasure, and she lives with them as simply as possible in rural Somerset. Fiona is mother to two children who were both born at home in water. She is passionate about supporting women in their choices around birth, and this has led her to offering her skills as birth supporter or doula. Fiona is a recognised doula with Doula UK, and has studied with many leading birth professionals such as Michel Odent, Penny Simkin, Janet Balaskas, Mary Cronk, Gail Tully, Sheila Kitzinger, Gail Hart, Sara Wickham, Uma Dinsmore Tuli, and Pam England. Fiona offers an individualised service (within a 20 mile radius of Frome, Somerset) which can include antenatal support, Shiatsu, birth preparation for couples using Active Birth and Birthing from Within ® techniques, birth support, and postnatal support including Shiatsu and help with getting breastfeeding off to a good start. Fiona is a Birthing From Within mentor and doula, and is a qualified Shiatsu practitioner. She has completed post graduate training in Shiatsu in Maternity Care with Suzanne Yates, and is qualified to teach acupressure/Shiatsu techniques to couples that are appropriate for pregnancy and birth. Dancing is something that Fiona loves, and she teaches belly dancing for pregnant women and new mothers, bringing the dance back to it's roots of celebrating and encouraging fertility. Fiona has been trained in breastfeeding peer support with the NHS, so can offer help around breastfeeding issues or difficulties. Fiona has supported women both at home and in hospital with their births, and has personal experience of home waterbirth. She loves supporting women with their health and mothering journey, and has been supporting women and their families for over 12 years. Fiona is also the contact for the local homebirth group.